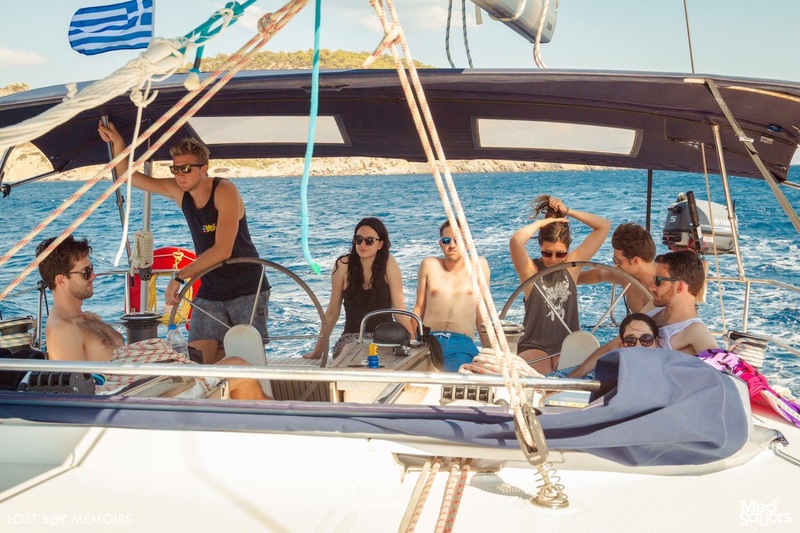 After two nights in Athens, we awoke to a blindingly hot Saturday morning and boy, were we ready to get cracking with our Medsailors trip around some of the Greek Islands for a week. 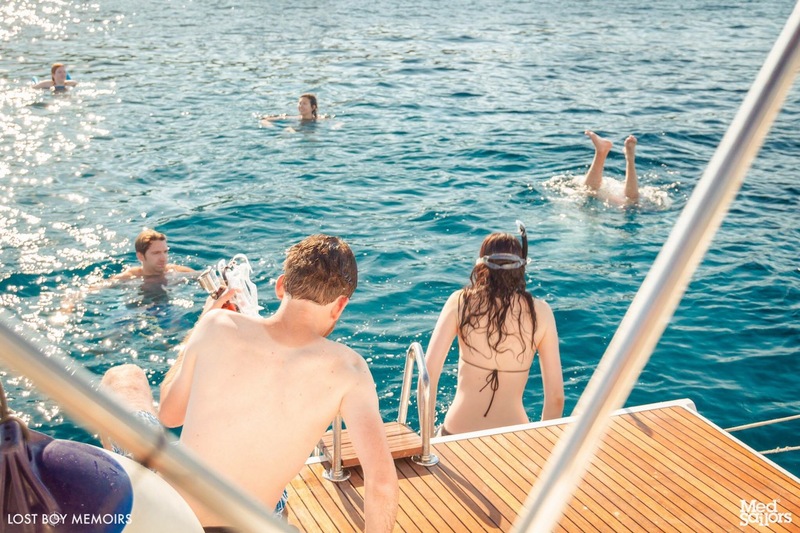 We had a boat of nine – Alex and myself, my little brother, and six other friends/relations of friends. 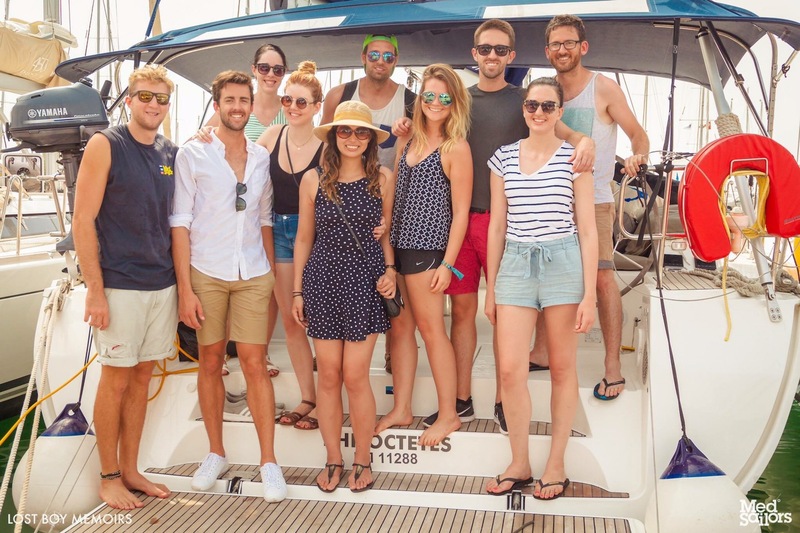 As we did in Turkey, our group opted to book a whole boat and fill with people we all knew, rather than booking places on boats where you would be sailing with a bunch of randoms (we have had friends who have done this and they really enjoyed it). We were all extremely excited to get on the boat and out onto the water. It was a gloriously hot day in Athens. We met our captain and got settled into the boat, stocked up on some essential supplies (mainly centring around alcohol, water and snacks, yes, the essentials), then set off around 3pm. 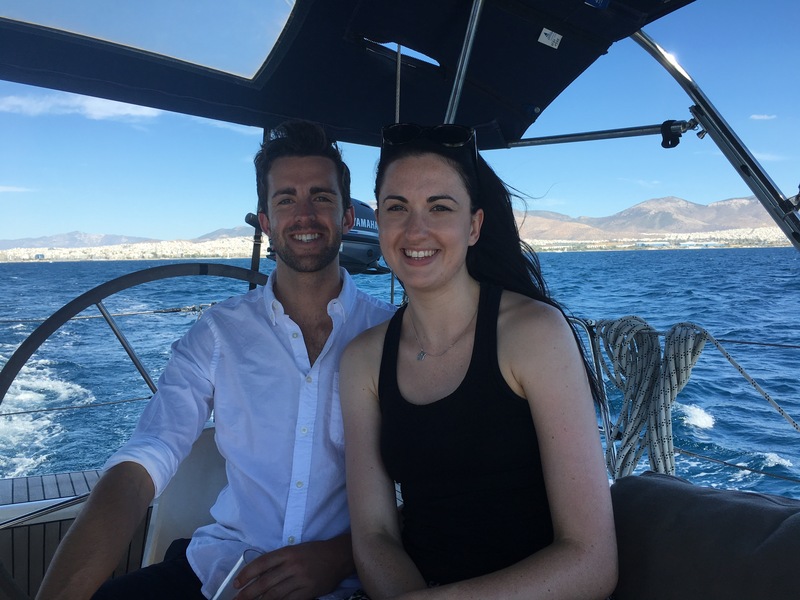 Before we headed on the trip, Alex had organised a fishing trophy to be made as we had such a fun time catching fish off the back of the yacht while we were cruising between stops. 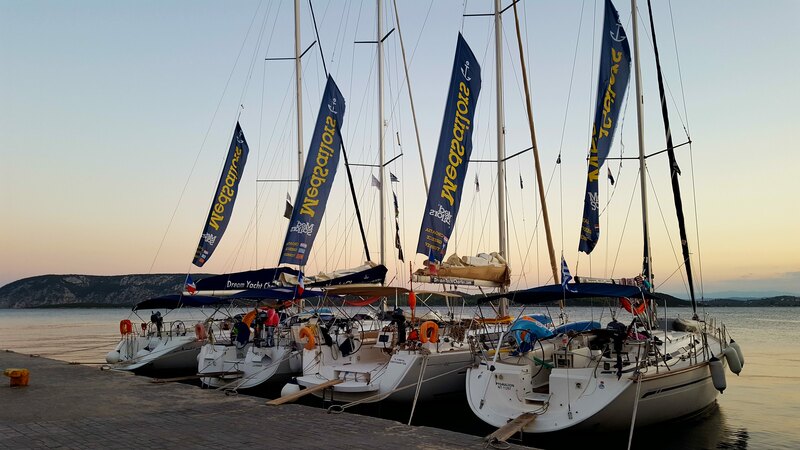 Unfortunately, we could not find the equipment we needed before setting off, so were not able to begin the competition straight away. The journey from Athens to Perdika was a short one, only an hour and a half. There was nothing spectacular to see as for the majority of the time we were just cruising near a shipping channel, so it was pretty busy. Perdika was one of the smaller and more remote stops on our trip. It was a little fishing village with a couple of bars and restaurants. Immediately when we arrived we jumped in the ocean around the corner from the marina to cool off. I think our captain knew exactly what kiwis are after from a Medsailors holday (maximum swimming time) so recommended the best places for us to go. Later in the evening we had a team dinner of meze at one of the restaurants. Our captain was so fantastic and came with me to talk to the restaurant owners to make sure there would be things served that I would be able to eat with my nut allergy. I appreciated that so much. The restaurant staff were amazing and even made me a special filo wrapped feta with honey to ensure that there were no nuts on my one. Great service. 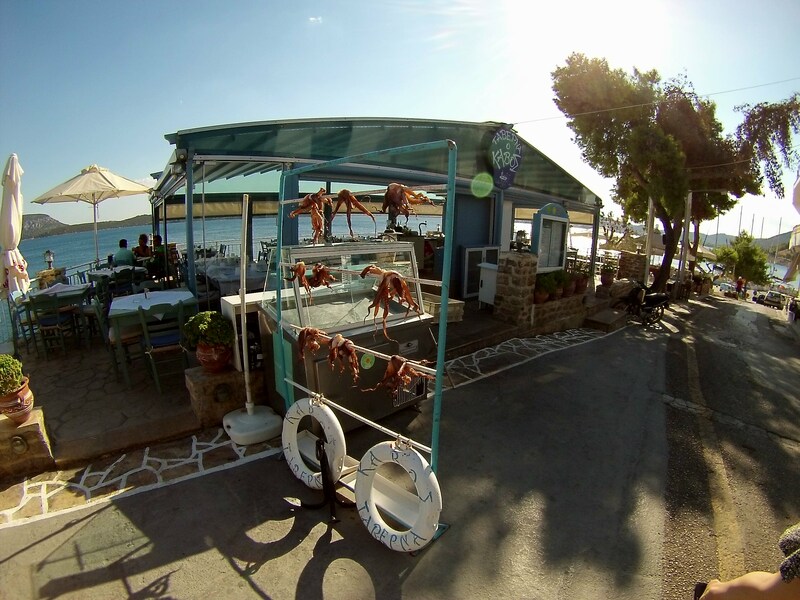 Alex and I awoke early in the morning and hopped ashore to explore the village in search of the requisite freddo espresso to which we were well and truly addicted after only two days in Greece and a fishing line. We were able to source some great coffees but had little luck with the fishing equipment – one shop sold hand lines but no lures or tackle so we had to postpone the competition. We left the marina early, around 8.30am, with a good portion of the boat making the rookie decision to stay in their cabins rather than get up for the sailing. 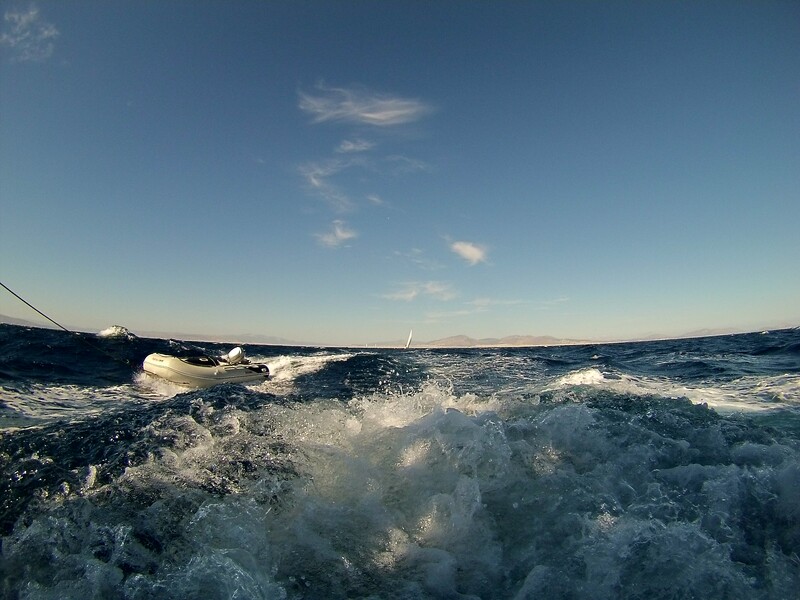 This was going to be the longest sailing leg of the trip – 4 and a half hours in total. We motored to a nice little bay and moored up for breakfast and a swim. 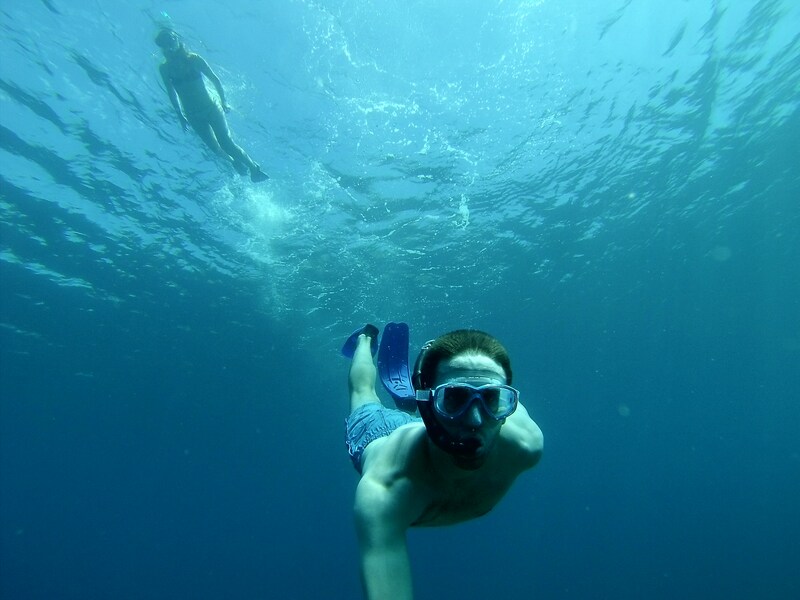 Immediately we were pleased with our decisions to buy the expensive snorkelling gear as the masks fitted perfectly and were much softer on your face (who would have thought spending more money got you better things!). Unfortunately, there was virtually no wind, thus we motored the whole way and had a fairly uneventful sail, just lounging around in the sun and stopping for the odd swim. Pretty delightful. When we reached Ermioni, Alex and a few others went off in search of fishing gear. They returned with that, plus a giant net, which we immediately tried to catch the baby fish with in the marina and having no success whatsoever. 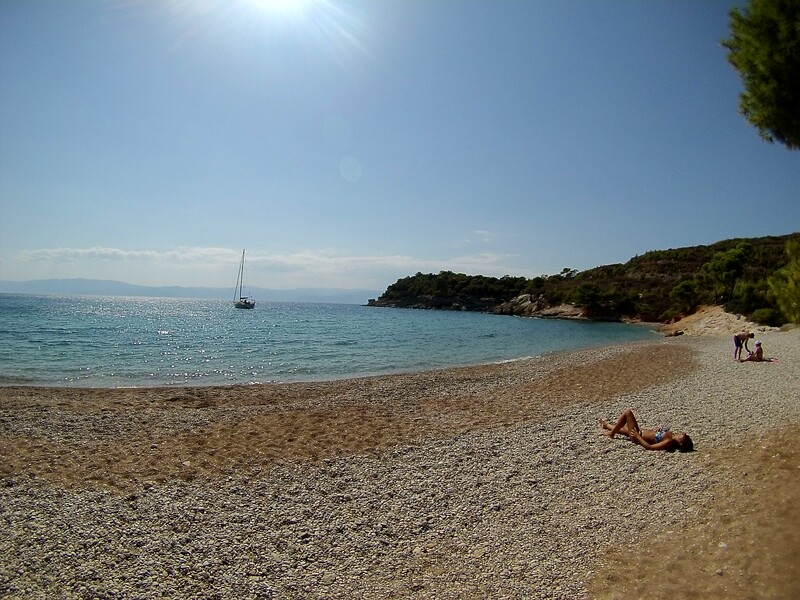 We went for a walk along the coast and found the most beautiful, secluded cove for swimming. It was in the perfect spot to catch the afternoon sun. Unfortunately, I had a reaction to something in the water and had tonnes of little red dots over my back. A similar thing happened while we were in Croatia and I have yet to be able to work out what caused it. 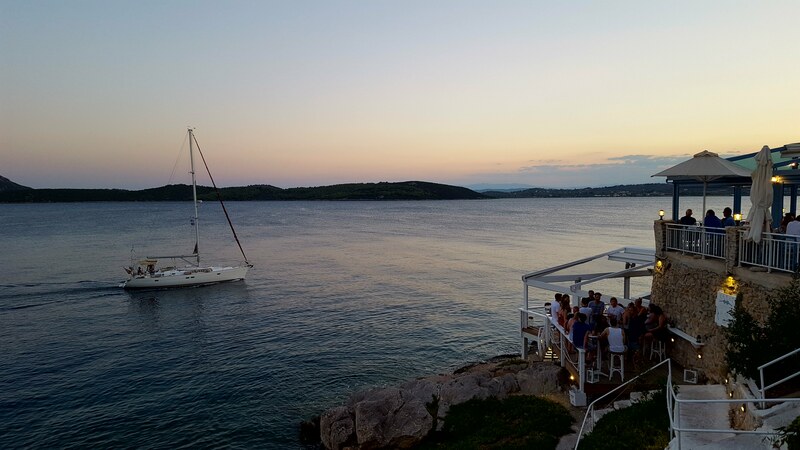 After our delightful swim, there was a punch night hosted by MedSailors at one of the coastal bars with a great view of the sunset as it was slightly up the hill. Afterwards, we stayed around for another team dinner, a delicious meze again. The best thing about Greek food is that for all the fried cheese and pastry you eat, you also get served amazing salads and other healthy food. The perfect way to eat on holiday. 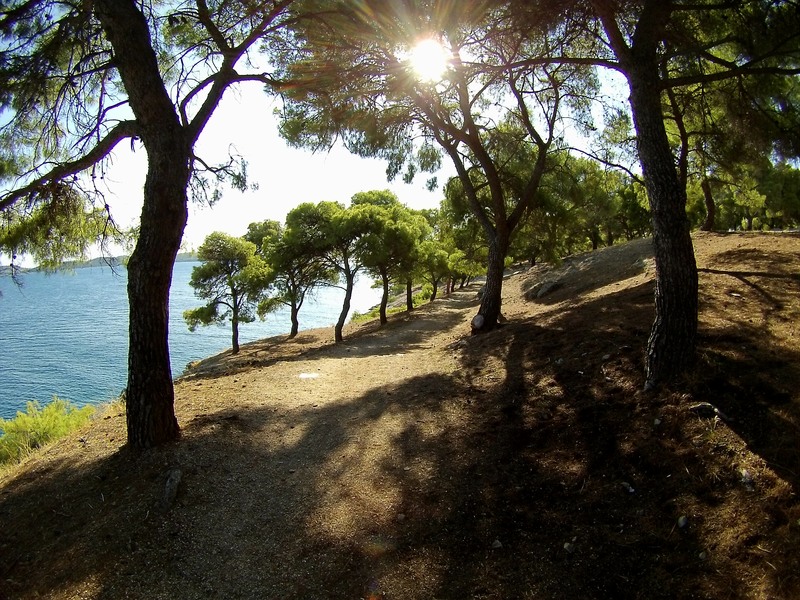 Again, we started the day early, leaving to have breakfast in another day and get to Spetses early. The early morning swim was a great way to start the day . The exciting part came next when Alex managed to land a fish. It happened quite soon after the line went down so we assumed that meant there were a lot of fish out there and we would have a great time fishing. Nope – this was the only fish that we caught on the whole trip. So Alex retained his trophy and title of Greek God of Fishing by catching the one and only fish. Spetses is a small island where there are basically no cars on the road, only scooters, quads and bikes. 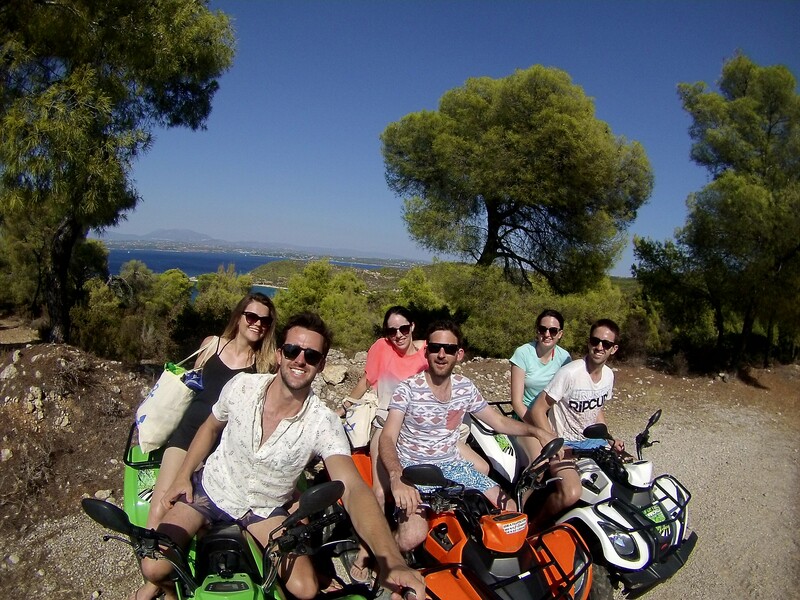 Six of us decided to hire scooters as you could take two people per scooter and set off after lunch to explore the island. We had a slight issue after lunch as one of the others tried to come along and hire a scooter but didn’t have a drivers licence then the scooter hire place would not rent a scooter to another girl in our group because she had ‘licence issues’, i.e. she was a girl. Pretty annoying and a waste of our exploring time. Once we had sorted what everyone was doing, we took off on a loop of the island. The quads were majorly underpowered so struggled to make it up the hills. Eventually we found a nice secluded cove to stop at and have a swim in the beautiful, clear water. We managed to meet up with the rest of our boat at one of the beach bars closer to the boat and chilled out there for the rest of the afternoon. In the evening we all went out to dinner in the town and decided on a seafood restaurant. I ordered the swordfish as I had never tried it before and was not impressed. It was pretty tough and tasted overcooked, but having had swordfish again since then and encountering the same problem, I think it must just not be a nice fish to eat. We had a pretty cruisy sail over to Hydra, arriving early afternoon. The mooring for this stop was in a bay around the corner from the town, rather than in a marina which was novel for this trip. 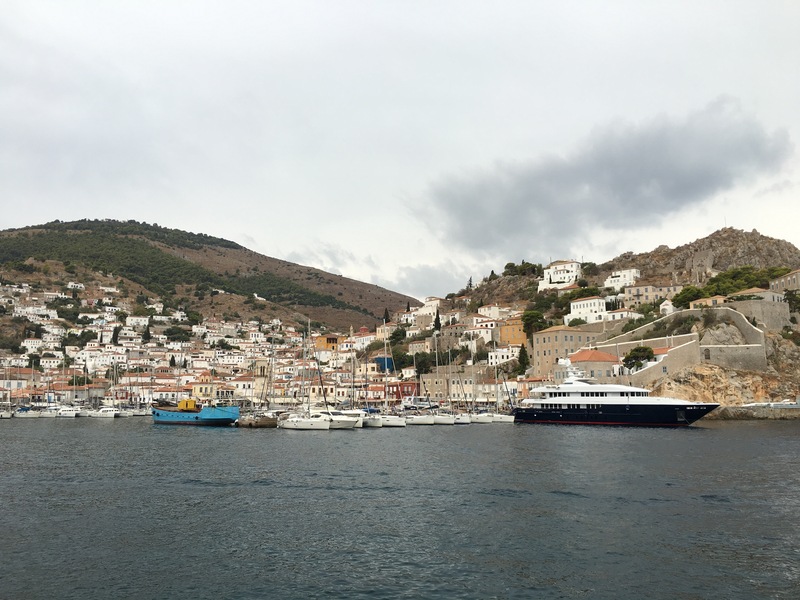 You could either get to Hydra by water taxi or walking. It proved problematic for us to order a water taxi as they only take a maximum of 8 people and we were a boat of 9, not including our captain. Instead, we decided to walk around the cliff road which took about 25 minutes. 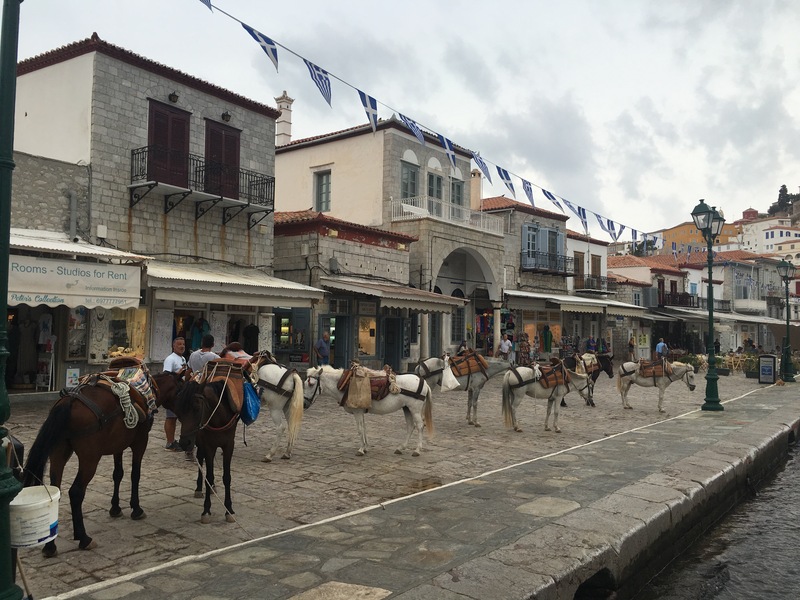 It was a pretty grey day, but by the time we made it to Hydra, it had started to rain. We walked around looking for somewhere to eat but none of the restaurants we tried would serve food until 6pm and we were all too hungry to wait so we ended up going to a small souvlaki shop which turned out to have fantastic food. Half way through our meal it really started to pour down so we had to abandon our outside table and take shelter in the tiny shop with all the other patrons. The rain did not look like easing any time soon so we ordered another round to try and wait out the storm. We started to think there might be something a little more serious going on than a small rain shower when all of the shop owners started boarding up the doors of their shop, and soon we saw why. The street outside the shop had quickly turned into a river, almost knee deep. We were not leaving any time soon. We were beginning to get a bit worried about how we would get back to the boat as the sun had set and the rain was still pouring out of the sky. Finally after about another hour, the rain began to ease, so the boys rushed off to the bottle shop go grab more supplies, and we headed to the marina to organise a water taxi home. Thankfully, there was a kind taxi driver who was willing to ‘squeeze’ nine people in so we could get home safe. When we got into the taxi we could not understand why they had a limit of eight people as the taxi was huge! Once we were back on the boat, we settled in for the night and played a hilarious game which one of the girls on the boat had brought with her called the Game of Things. As you can imagine with any game, things got slightly out of hand at one point and there was an argument or two, but overall it was very fun and entertaining. It was still pretty grey when we woke up, but the rain had stopped, thankfully. We set off and then our captain announced that we could put up the sail (I think this came because he was sick of me asking when we would be able to sail. The sails were up for a grand total of about an hour because the wind died off and we weren’t going fast enough. We were also being chased by a large lightning storm and rain cloud. This was quite disconcerting as it was a massive lightening show where the whole sky behind us would light up and we were travelling in a vessel with a large metal rod sticking up into the sky. We survived so all good. Poros was a really busy marina and unfortunately because of our sailing, we missed out on a spot where you were allowed to park so tried to rope onto another boat right on the edge of where you could park. This was noticed immediately by the coast guards who happened to be Lara Croft clones, so I don’t think our captain was too sad about getting a talking to from them. We wanted to find somewhere to swim for the afternoon so headed off on foot to find a beach. What we were able to find was pretty disgusting. The beaches were dirty and the water was not the crystal clear, sparkling blue we were used to. I was not keen to stay in for long. Once we got back to the boat, it was time to make the trek up the mountain behind the marina to watch the sunset. This was the perfect spot to watch the sunset and I am so glad we made it up there in time. That evening, we went to another team dinner which was a meze that the restaurant guy made us order about twice as much food as we needed. Again, they recommended the Swordfish and it was just as disappointing as the first time. The rest of the food was fantastic, particularly this delicious slow cooked lamb that was melt in your mouth. 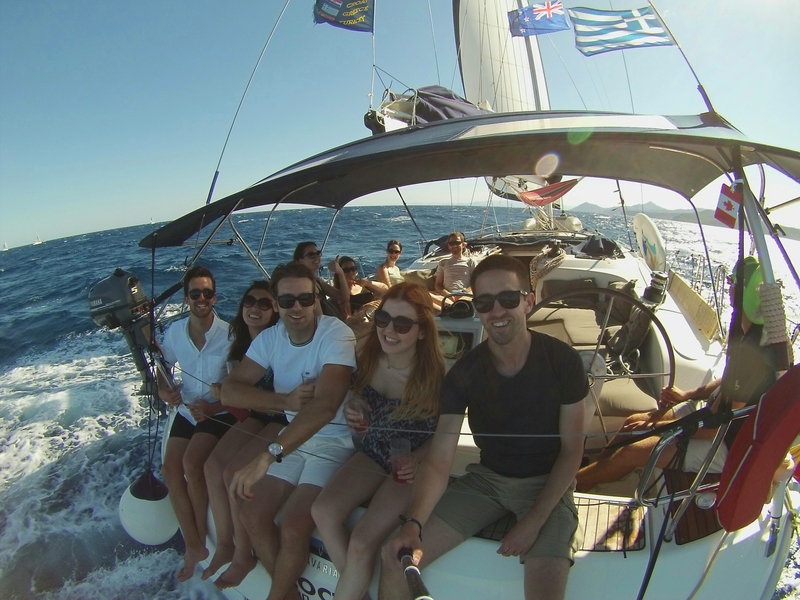 It was a fairly short sail to the next stop, Agistri. We were all a little depressed that the trip was quickly coming to an end. Agistri was meant to have kayaking so we headed off as soon as we moored in the marina to find some. We found the kayaks but absolutely no one was to be found who we could pay to take them. That was pretty annoying as we had walked quite far to be able to do that. The boys decided to swim to get back to the boat as it was quite shallow and a long, straight coastline. We stopped at a coastal restaurant and ordered some snacks to keep us going – beer, rose and calamari. That evening, we had a buffet dinner with all the Medsailors crews at a hotel on the hill. 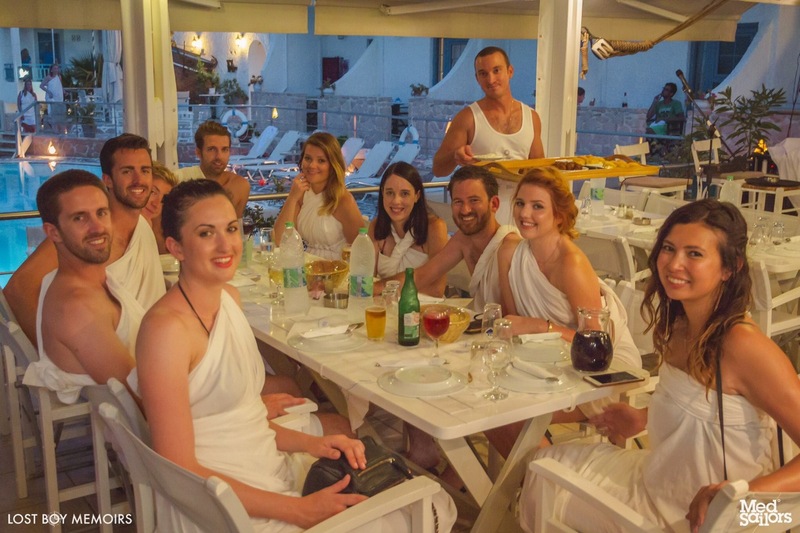 This was also a toga party, so we spent a stressful hour trying to twist our bed sheets into a shape that resembled a vaguely Grecian garment. The success of this varied across the boat. This is probably Alex’s favourite day of the whole trip – the day he became a hero. We were the last boat to leave the harbour and as we were leaving our captain noticed that our anchor was caught around a giant shipping chain that was conveniently lying across the floor of the harbour. He was reluctant to call any of the other captains back to help him so Alex volunteered to dive down and dislodge the anchor. It was quite a deep dive, but Alex managed it in two goes as he had developed fish-like diving skills over the week where he spent every spare second in the water diving. It was really sunny and beautiful on the way home. We had a last ditch attempt to catch more fish and provide a little competition in the run for the fishing trophy, but no one had any luck. We were obviously sad to end the trip, however, Alex, two of our friends and I were set to head out to the beautiful island of Santorini after a couple of nights in Athens, so more of our Greek Odyssey to come. Stay tuned. 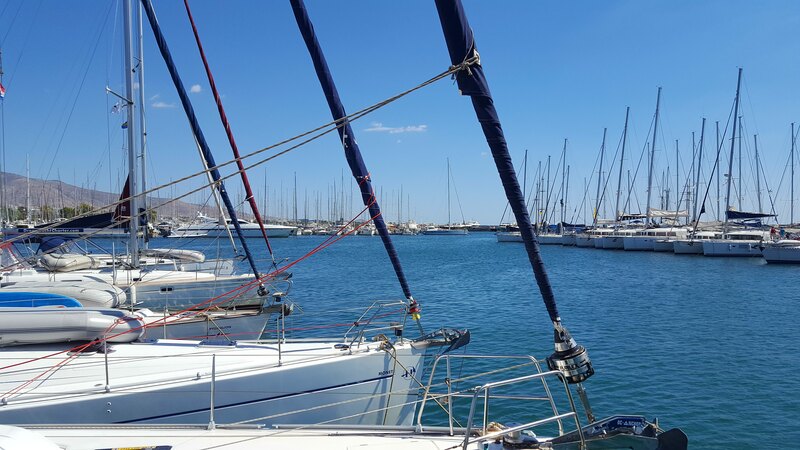 Note: as per last year, we enjoyed this sailing trip so much that we have booked another adventure, this year on the new Sicily route around the volcanic islands at the bottom of Italy. Bring on the sun, vino and pasta!